A Pineapple Express weather pattern dominates the West this weekend. The result is abnormally warm temperatures and heavy amounts of rain and snow. In the Northeast, one to two storm systems are lined up with cooler than normal temperatures. 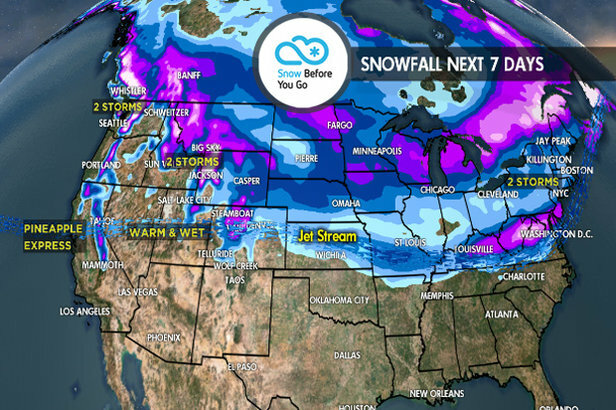 Colorado, Utah: There are two storm systems lined up over the next five days. The first storm delivers moderate to heavy snow accumulation on Thursday in Utah and Friday in Colorado. Warm temperatures keep snow levels high. The heaviest snow falls above 8,000 feet in Colorado. The second storm system delivers heavy snow accumulation on Saturday in Utah and between Saturday night and Sunday in Colorado. This storm is even warmer than the first storm. Snow levels will be higher in both Utah and Colorado with rain in most mountain valleys. In Colorado, this storm has the potential to deliver a foot of heavy, wet snow accumulation above 9,000ft in a short amount of time. Sunday and Monday will be prime ski days at Loveland, A-Basin and Winter Park. Wyoming, Montana, Idaho: There are two wet, warm storm systems lined up over the next five days. Light snow continues on Thursday and intensifies on Friday. Snow levels will run high with rain in many mountain valleys. Moderate to heavy snow accumulation. The second storm system is stronger, wetter and warmer on Saturday and Sunday. Heavy snow accumulation is likely at higher elevations. Shoot for higher elevation ski areas throughout the weekend from Schweitzer to Sun Valley and Big Sky to Jackson Hole. Northeast: Expect leftover snow showers on Thursday morning, then drier until an Alberta Clipper delivers light to moderate snow accumulation on Friday. Friday is a good day to ski. A second storm system slides south of the area on Saturday, but it could still brush the area with light snow and colder temps into Sunday morning. A third storm system could approach the area on Tuesday-Wednesday. California: The Pineapple Express dominates the weekend pattern. Warm, wet conditions are likely. Friday and Saturday are the two wettest days. It looks like mostly rain at the ski areas initially, then changing to snow Saturday evening into Sunday. Shoot for higher elevation ski areas. Heavy amounts of precipitation accumulation likely. Another storm system is possible on Tuesday. Pacific Northwest: The Pineapple Express dominates the weekend pattern. Warm, wet conditions are likely. Heavy amounts of precipitation accumulation is likely on Thursday, Friday, Saturday and Sunday. Snow totals on the high volcanoes and Cascade peaks could range from 1-3 feet. Whistler/Blackcomb: The Pineapple Express dominates the weekend pattern. Warm, wet conditions are likely. Heavy amounts of precipitation accumulation is likely on Thursday, Friday, Saturday and Sunday. Rain showers are likely lower on the mountain with snow mid-mountain and higher. Moderate to heavy snow accumulation up high. 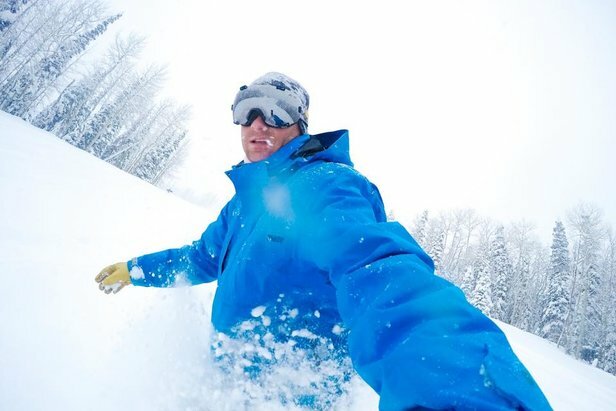 Tomer's Take: Ski Whistler/Blackcomb or Jackson Hole on Friday, Alta, Snowbird or Loveland on Saturday and Jackson Hole, Grand Targhee or Mammoth on Sunday; as a bonus ski Loveland or A-Basin on Monday.